#Curfew: @SkyOne's brand new action-packed series looks AMAZING – but what do we know about the release date, plot, and cast? Curfew release date, cast, trailer, plot: When is Curfew out on Sky? Sky One series Curfew premieres on the Sky channel in 2019, with an exact release date predicted for February. 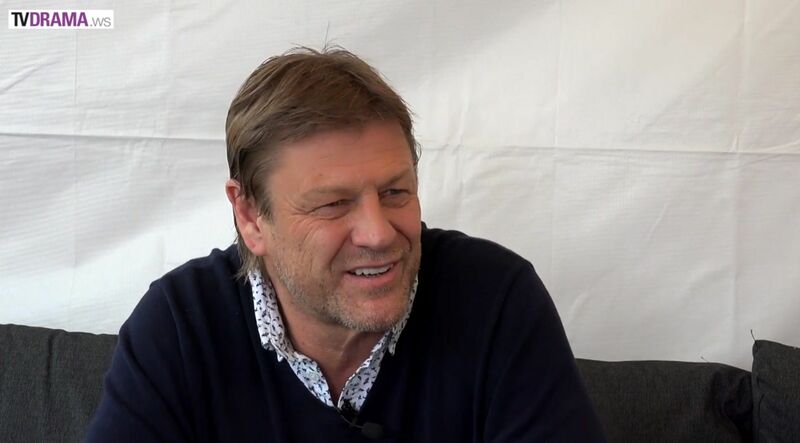 A Sky original production, the series boasts a star-studded cast including the likes of Game of Thrones’ Sean Bean and ITV’s Trauma star Adrian Lester. With fans eagerly awaiting to watch season one, we take a look at the Curfew release date, cast, trailer, and plot. The official account for the exhilarating new street race drama coming to @SkyOne this year. Ladies and Gentlemen, start your engines. The countdown has begun. #Curfew. @skyone. The race commences Feb 22. For our Curfew teaser campaign we've put together a series of retro-looking car ads. You might recognise some of the drivers? Sean Bean, Billy Zane and Adrian Lester all starring. There’s something for everyone in Sky One’s brand new street racing drama; comedy, tension, romance - and some really really fast cars: Curfew is a brilliantly original beast that finally demonstrates exactly what Mad Max would look like in a country where everyone’s favourite reference point is the Bake Off. 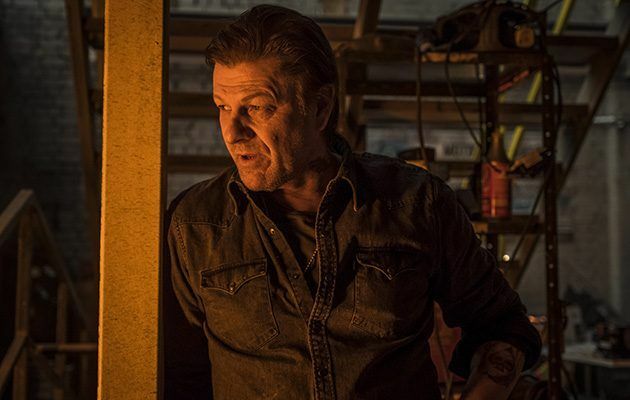 With an all-star cast including Sean Bean, Adrian Lester, Miranda Richardson and Billy Zane, the show follows a group of ordinary Brits who don't want to live in a controlled world and will do whatever it takes to win their freedom. There might be more rules and much less freedom, but life in Britain under the Curfew is kind of going on as normal. At least, it is in the daytime. When night falls, a tyrannical government obliges everyone in the country to stay inside with the doors locked and windows shuttered – because there’s something out there, and it’s not friendly at all. People make the best of the situation, but once a year, surprisingly ordinary people risk everything for freedom in the world’s deadliest illegal street race, just so long as they survive the terrors of the night – and each other! 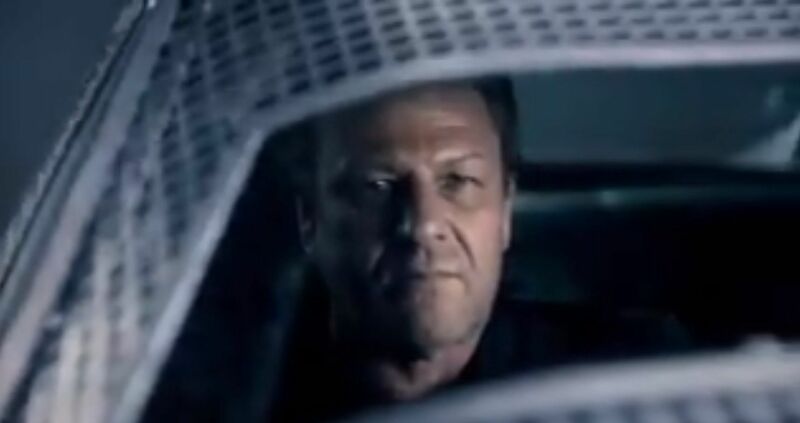 Each episode tells the story of one of the teams, whether they’re an ordinary family just trying to escape, two sisters and a boyfriend on-the-run or a mechanic (Sean Bean) and his pregnant girlfriend. 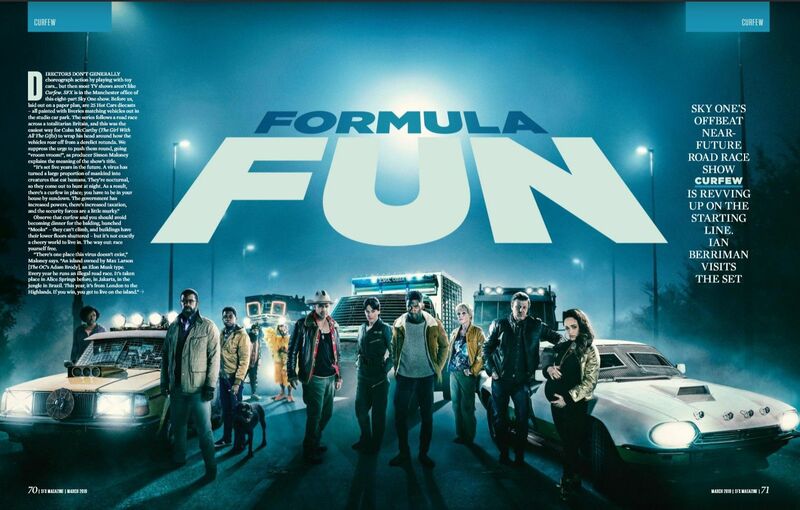 There’s something uniquely British about taking a popular American format: the racing action blockbuster, and filling it with real, relatable people, wry humour and some surprising stars thrown in. 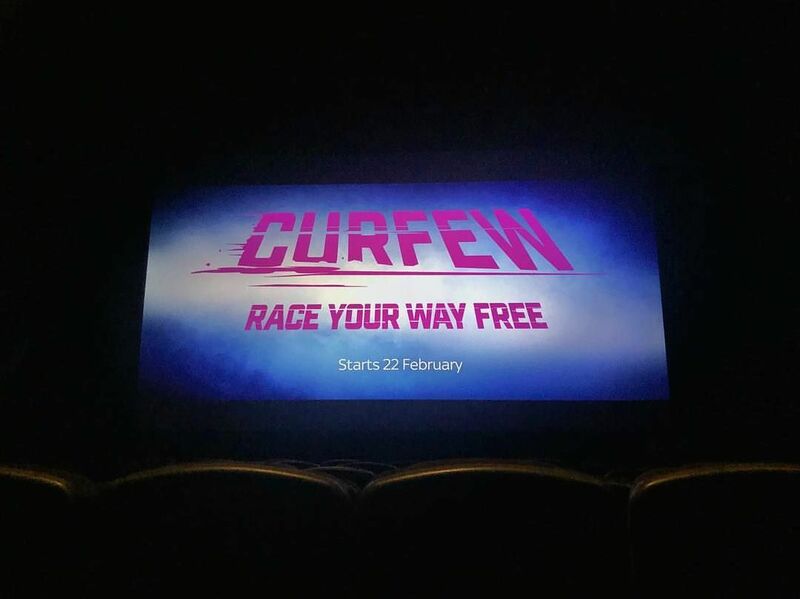 Join Curfew’s crew of ordinary Brits as they speed their way to one single shot at freedom in the world’s deadliest street race. Who will survive the Curfew and win a new life in paradise? Video interview in this article. In a post-apocalyptic world riddled with deadly nocturnal creatures, an annual event allows for the citizens of a totalitarian state to participate in the potentially life-changing race that’s at the center of Curfew. The prize at the end of the nighttime contest, which stretches from London to Scotland’s northernmost point, is said to be freedom from the government and its mandated curfew on a creature-free island. Among the participants in the battle royale is The General, played by Game of Thrones alum Sean Bean, and Billy Zane’s Joker Jones cowboy character. Malachi Kirby, Phoebe Fox, Adam Brody and Miranda Richardson are also among the star-studded cast of the eight-part series, executive produced for Tiger Aspect Productions by Will Gould and Frith Tiplady in association with their new indie production venture Moonage Pictures, and directed by Colm McCarthy. Talking to TV Drama Weekly’s Mansha Daswani, Curfew’s Bean, Zane, Kirby and Fox explain what drew to them to the project, how they prepared—or wish they’d prepared—for the action-packed series and why it’s like nothing else on television. As for the creative trio of Gould, Tiplady and McCarthy, they discuss how the idea for the street-racing drama came about, what convinced them that it was better-suited for the small screen and the coup of landing the likes of Bean, among others, to make the idea come to life. 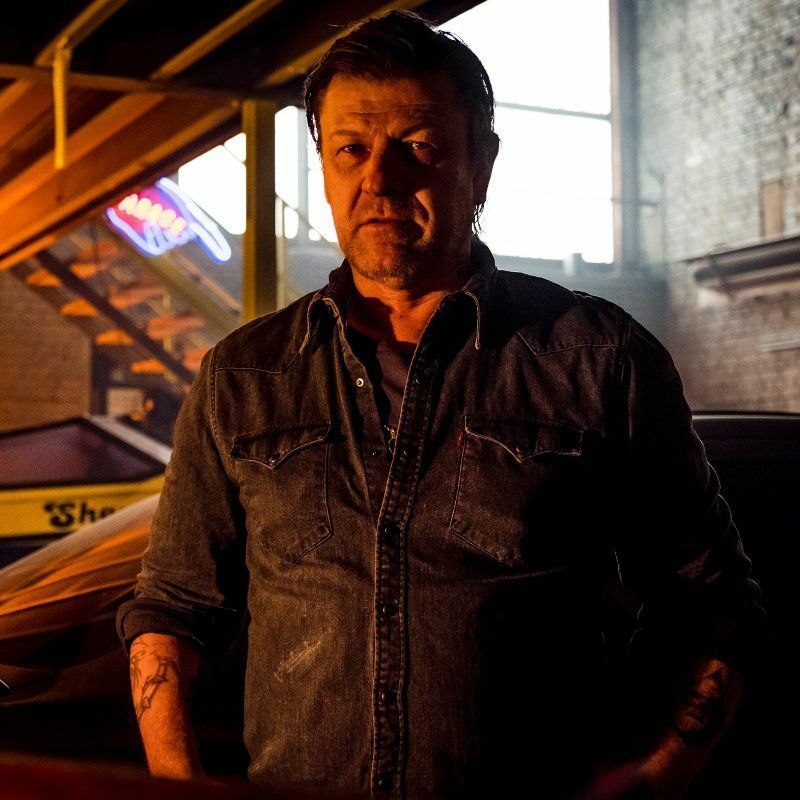 Curfew, which is distributed by Sky Vision, premieres on February 22 in the U.K. on Sky One and NOW TV. Getting excited for tonight's premiere screening of @SkyOne's @CurfewSeries starring our wonderful #PhoebeFox @GuzKhanOfficial #RobertGlenister @JPdavies93 !! At the #Curfew launch. Billy Zane is talking about Dada and surrealism. That was quite the spectacle! Just watched the first episode of #SkyOne’s upcoming drama #Curfew... Starts Friday 22nd Feb. The stellar line up of Sky One's Curfew join us in the Build studio. 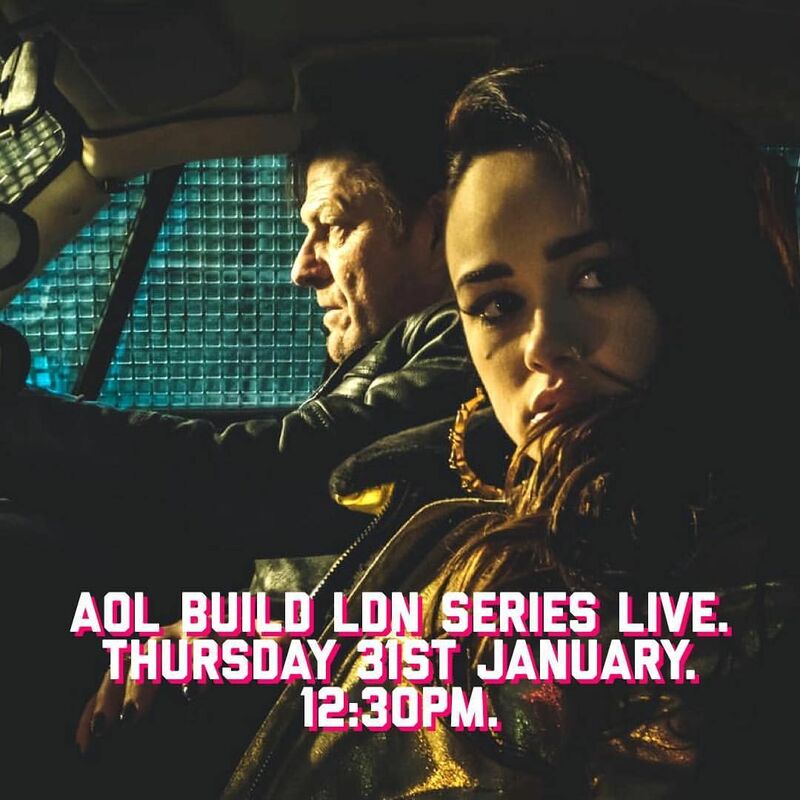 Sean Bean, Phoebe Fox, Malachi Kirby, Andi Osho, Colm McCarthy, Billy Zane, Rose Williams and Miranda Richardson will be discussing the new thrilling show with Rhianna Dhillon.
.@SkyOne’s cast of #curfew are in to talk about the new series that documents the lives of ordinary people caught up in the one a year deadliest race, LIVE on Thursday 31st January at 12:30. Hey gang! 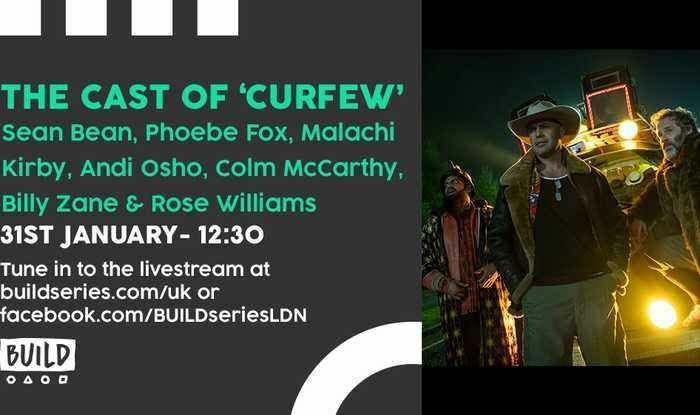 I will be hanging out with some of my cast mates from #Curfew on @buildseriesldn today at 12:30pm talking about the show. Hope you can catch it. Cheers! 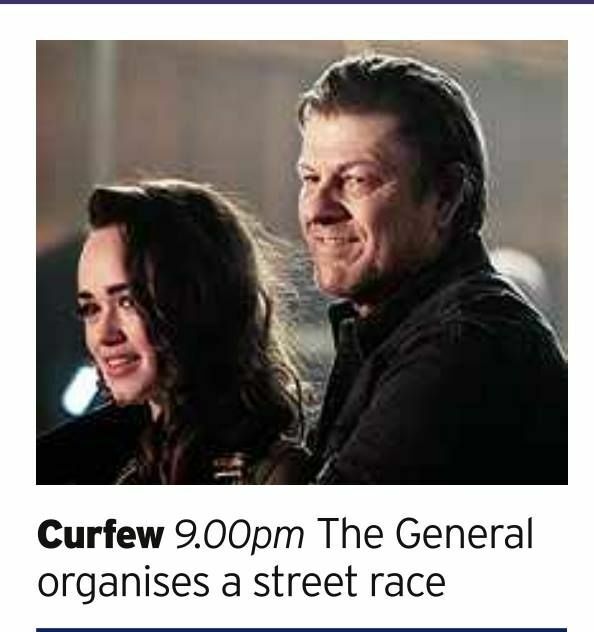 Curfew, an eagerly-awaited new Sky One Drama, with street-racing cars, monsters, and yes, queenie from Blackadder. From the start line to the checkered flag, this job went from photoshoot doc right through to retouch. #Curfew badass @theandioshow will be appearing on @BBCRadioLondon today at 2:30pm! Be sure to tune in. 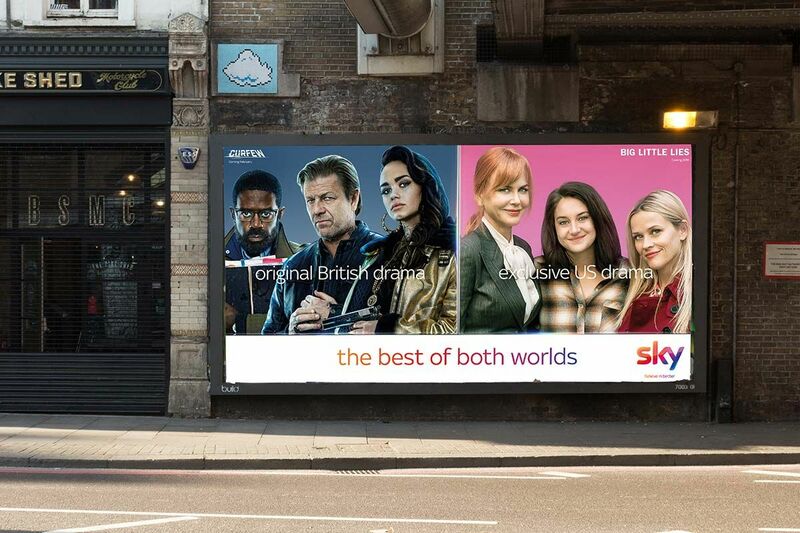 Recently we attended the Premiere Screening of the first episode of @SkyOne’s new epic @CurfewSeries starring @BillyZane, @rose_williams_, @andiosho & many more! Here’s a short video of our evening. 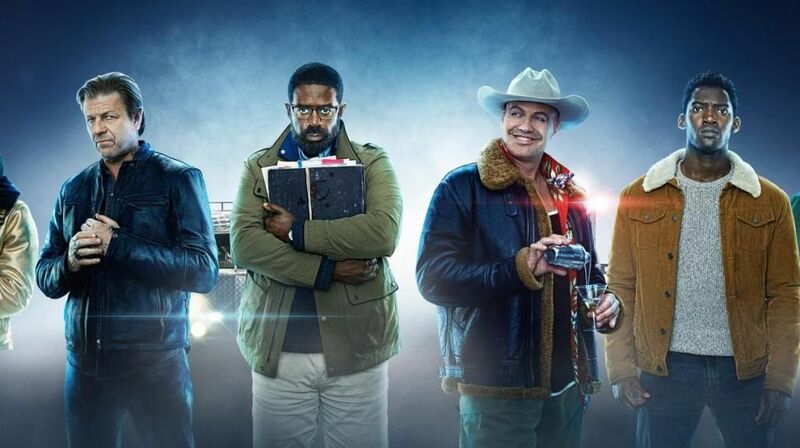 Make sure you catch the first episode of #Curfew on @SkyOne on Friday 22nd Feb! 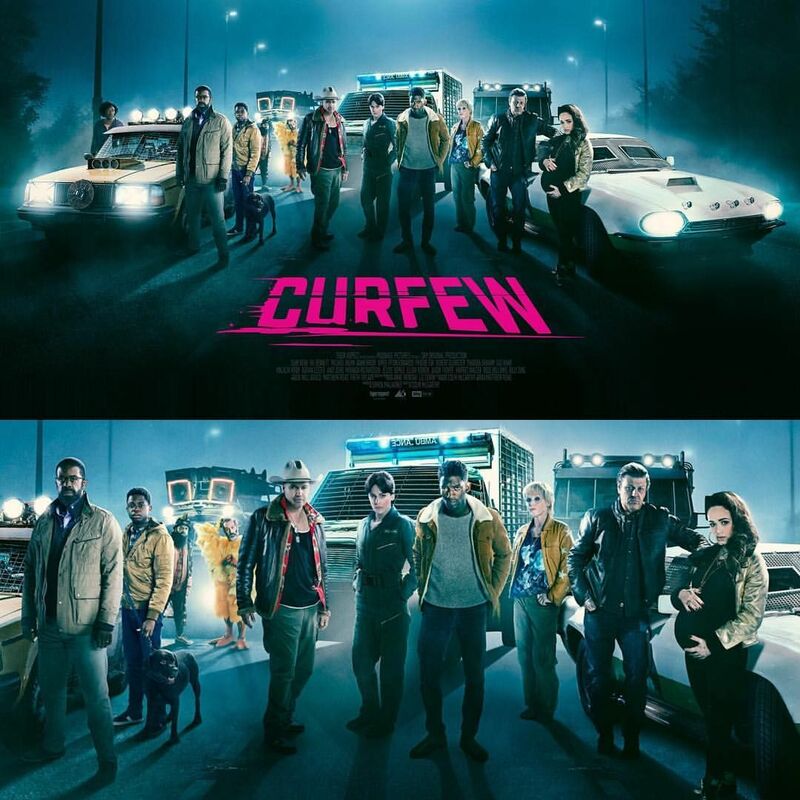 After working with Sky One and Curfew at Comic-Con 2018 earlier this year Sky One contacted us again and invited us to attend the UK premiere/launch of ‘Curfew’ at Village Underground in Shoreditch on Tuesday 29th January. 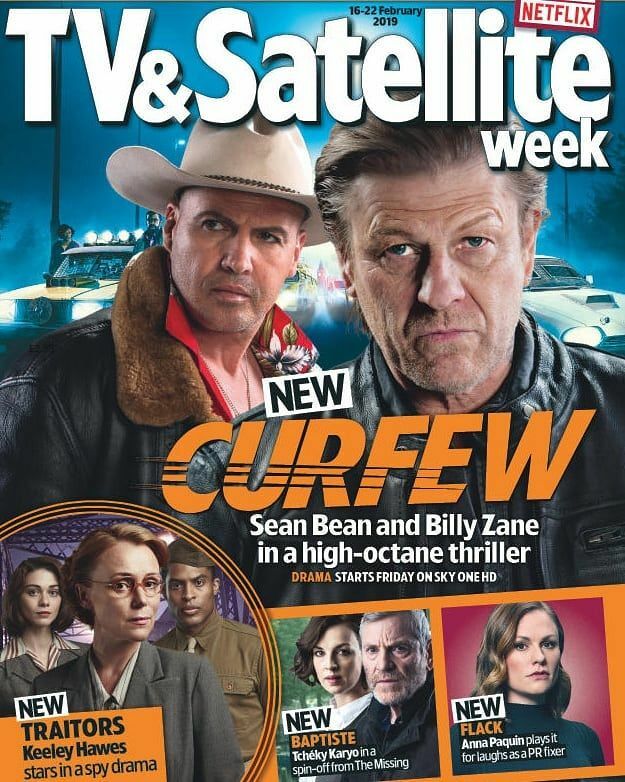 Boooom  Finally I get to share this image of the upcoming @skyone series @curfewseries starring the awesome @sean_bean_official @billyzane #mirandarichardson #malachikirby @adrian_lester @phoebemercedes @ike_bnntt @rosevictoriawilliams @theandioshow @guzkhanofficial @jaytee73 . I had such a blast shooting the #iconics #specialphotography for this dynamic #publicity image created by the skilled @33rebel . Sky Spain has already announced its premiere of exclusive fiction for the month of March. 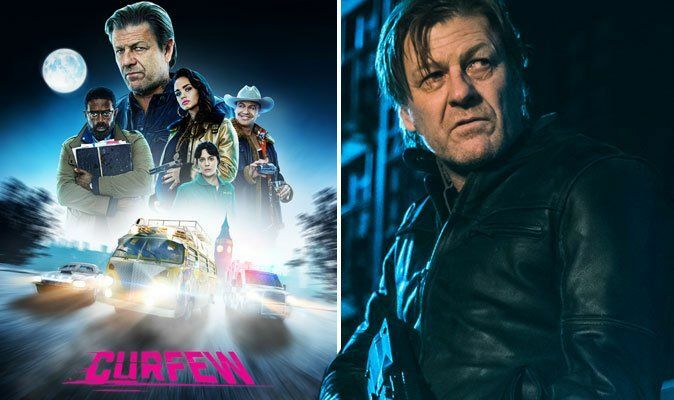 After the exploration of the faith and the politics of The Miracle , the platform changes of third and emits one of science fiction and action in abundance, Curfew , a British production that counts on the protagonism of Sean Bean as one of its great attractions. The series takes us to an apocalyptic world in which people can not walk freely at night . A curfew has been established that no one can break, and for which citizens are confined to their homes. In that scenario, a group of desperate people are aiming for a risky career that can lead them to freedom. Curfew will premiere on March 19, on demand, on Sky with its eight chapters. It is created by Matthew Read, scriptwriter of Peaky Blinders , and besides Bean, in its distribution they appear Adrian Lester, Adam Brody, Billy Zane or Rose Williams. Hey gang, if you’re around this Thurs 7th Feb at 1:30pm, I’ll be on @BBCRadioManc chatting with @BeckyWant about #Curfew. Just got to watch the TV preview of #Curfew courtesy of @BAFTAScotland and it looks absolutely fantastic! Out on Sky One February 22nd! Have been binge-watching @CurfewSeries which is coming to @SkyOne and @NOWTV from 22 February. It's brilliant. 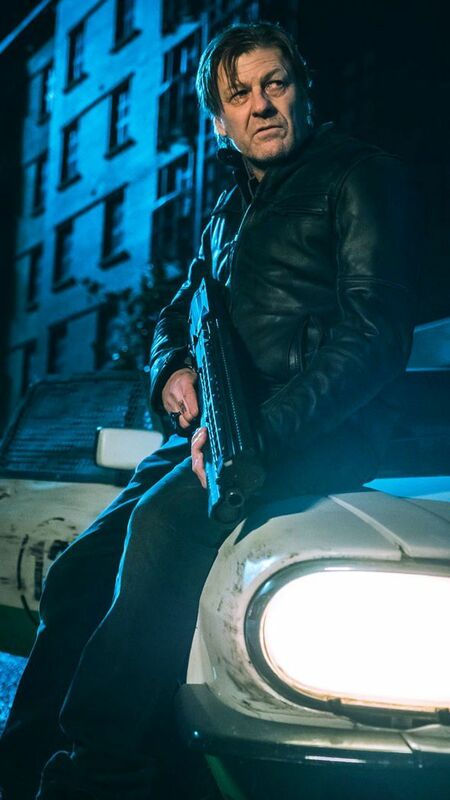 At the cinema y'day I did see a trailer for a new Sky show called Curfew which I would describe as "What if The Hunger Games had Seth Cohen from The OC as President Snow but also it's set in London and also it's kind of The Purge and Mad Max but also Sean Bean". Interest piqued. 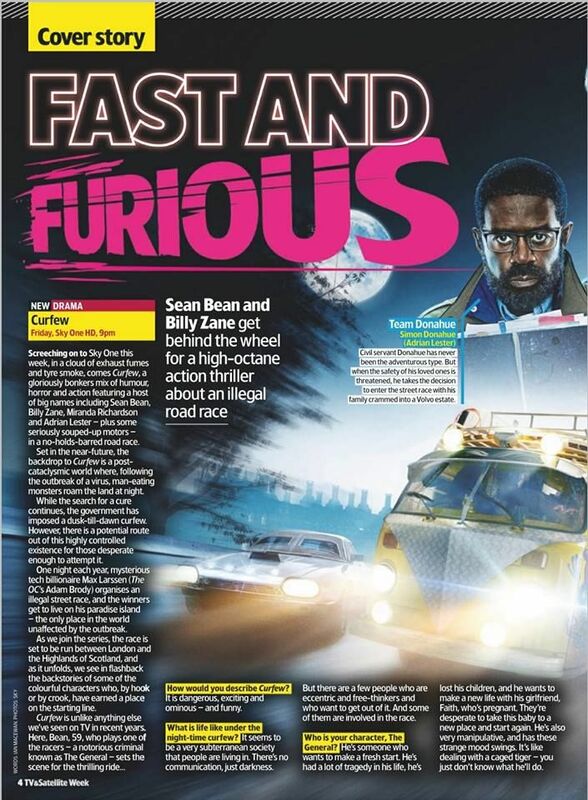 This thrilling mix of horror, humour and wheel-spinning action stars Billy Zane, Sean Bean and Miranda Richardson as rival drivers in an illegal night-time road race. In the near future, nocturnal man-eating monsters roam the world and, as a result, there is a curfew. However, the winners of the race get to live on a monster-free island. The series follows the wacky racers, whose backstories unfold in flashback, starting with ambulance driver Kaye (Phoebe Fox) and the family of geeky civil servant Simon (Adrian Lester), who plan to compete in their Volvo estate! Sean: The General enters the race because he wants a fresh start with his pregnant girlfriend, Faith [Rose Williams]. But he has these strange mood swings, so it’s a bit like dealing with a caged tiger! What did you think of the vehicles you get to drive? you can really throw it around. I did some stunt driving – but I had great instructors, so I was in safe hands! Billy: My vehicle is all about the cocktail bar in the back! What appealed to you most about this series? Sean: It’s different, but also relevant to what’s happening today – things are getting quite militarised in America. And I find dystopian tales fascinating. Billy: I had a conversation with the creators, who said, ‘We fashioned the Joker around elements of previous roles you’ve played, having no idea whether we could get you!’ So it was kind of a dream role. 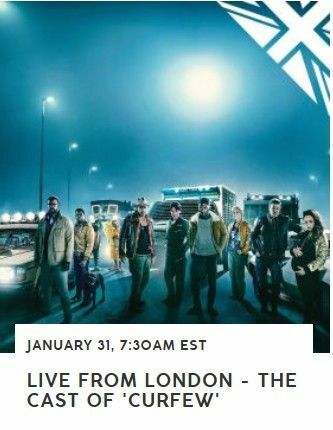 We're hosting a very special early screening of the first episode of Sky original production Curfew in a swanky venue in London so you can get a sneak preview - you should totally come! 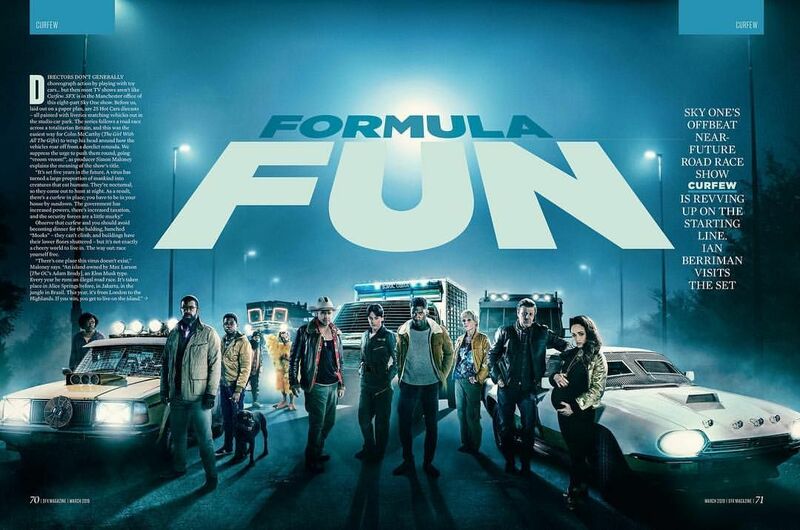 From the makers of Peaky Blinders, it's a drama set in the near future which sees teams of ordinary people compete for freedom overnight in the world's deadliest street race. The 'curfew' in question is a government imposed nightly lock down to protect citizens from a virus. 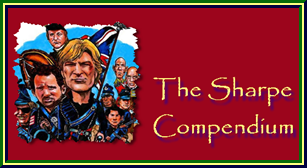 But an illegal race taking place over one night, with the ultimate prize, lures out various groups of misfits each with their own unique motivation for competing. It boasts an iconic ensemble cast including Sean Bean, Billy Zane, Miranda Richardson, Adrian Lester, Adam Brody and Phoebe Fox and has an anarchic John Carpenter '80s blockbuster vibe. Come and have a drink on us and check out episode one! The screening will take place on Tuesday 19th February in central London. Doors open from 6.30pm and the screening will start at 7pm. The closest tube stations are Covent Garden and Tottenham Court Road. Here's the important bit: We don't charge for these screenings, but please do not treat this as a competition. Please apply for a seat only if you can use it. We will try to accommodate requests for up to two seats, but please understand we expect this to fill up very quickly! Please can I have [insert number] seats for #Curfew @denofgeek #CurfewGeek. We will start getting in touch with people on Thursday to allocate seats - so make sure you check your Twitter direct messages! Note that you need to be following us, or we can't get in touch. Please also note: you need to be at least 18 years old. Cover and lovely interview with Sean with portrait on Curfew. At least the actors didn’t harm themselves. It’s a different story for the characters. An entertainment marketing first for Sky, and an exciting chance for us to create a bespoke IMAX wrap! We also produced targeted radio campaigns featuring lead talent with 9 bespoke creative executions.  Turn your sound on!